Tomato Bulgur Soup with Garam Masala | "Il faut goûter"
I love to visit my local natural foods store and browse their grains, spices, and flavorings (for me,this store is Good Shepherd Health Foods in Cookeville). There is always something interesting to be found! I’ve become confident enough in my cooking intuition to know that if I buy a scoop of this or a pound of that, I WILL use it soon in a recipe, or I’ll create a recipe to feature it. Then, I’m both delighted with the dish and with the fact that I’ve experienced a new ingredient! I win! I’m joyed! Today I actually went in search of farro, which I’ve read a bit about, but Good Shepherd was out. Instead I picked up a bag of bulgur, some millet, and some fennel seeds and cardamom pods. I was and am thrilled at the prospect of new flavors making their way into future meals in my kitchen! After a bit of research, and since that icy winter air has just set in in Cookeville, I decided a warm hearty soup would be a perfect dinner. 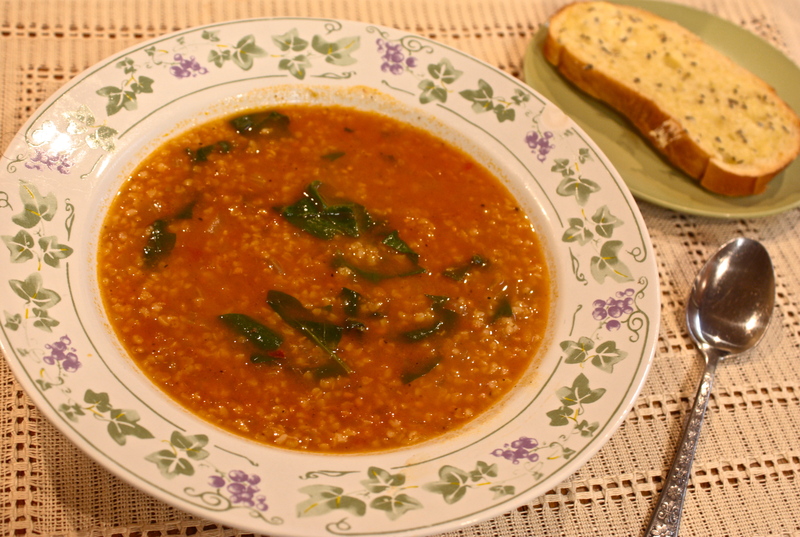 The rich spiced flavors in Indian cuisine are some I often crave, so I decided to use garam masala as the main flavoring for this Tomato Bulgur Soup. If you too love Indian food, you should pick up some garam masala–it’s a super-flavorful spice mixture that you can add to soups and curry sauces to recreate some of your favorite Indian dishes at home. Do it. You’ll be glad. Tonight’s soup turned out AWESOME. Full of spicy flavor and texturally pleasant with the slightly chewy bulgur. Altogether satisfying!! You could add other chunky vegetables if you like, or you could use Italian herbs if Indian’s not on your agenda. I think you should experiment with bulgur. I think you should try new spices. I think you should make this soup for people you love! Heat oil (and grease) in a large pot over medium heat, and add the onion and celery. Sauté until the onions begin to soften (about 5 minutes), then add the garlic and sauté a few minutes more, until everything begins to turn golden. Add the white wine and stir over medium heat for a minute or so, loosening any bits stuck to the bottom of the pan. Pour in tomatoes and add garam masala, curry powder, and crushed red pepper. Simmer, stirring occasionally, for 10-15 minutes. At this point, if desired, you could purée or partially purée the soup with an immersion blender, which will give your final soup a smoother texture. (I puréed about half of mine). Pour in the chicken broth and water. Taste for seasoning, and add more salt, pepper, or the other spices adjusted to your tastes. 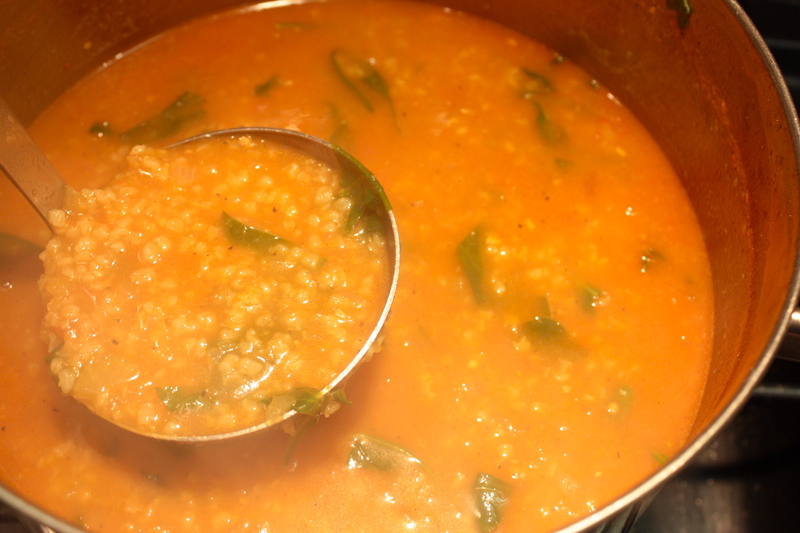 Bring the soup to a boil, then add the bulgur. Cover and simmer, stirring once or twice, until bulgur is tender, about 10 minutes. If the soup is too thick, add more water. Taste for seasoning at the end, and if desired, add a handful of torn fresh spinach leaves. Stir and cook a couple minutes until the spinach wilts. 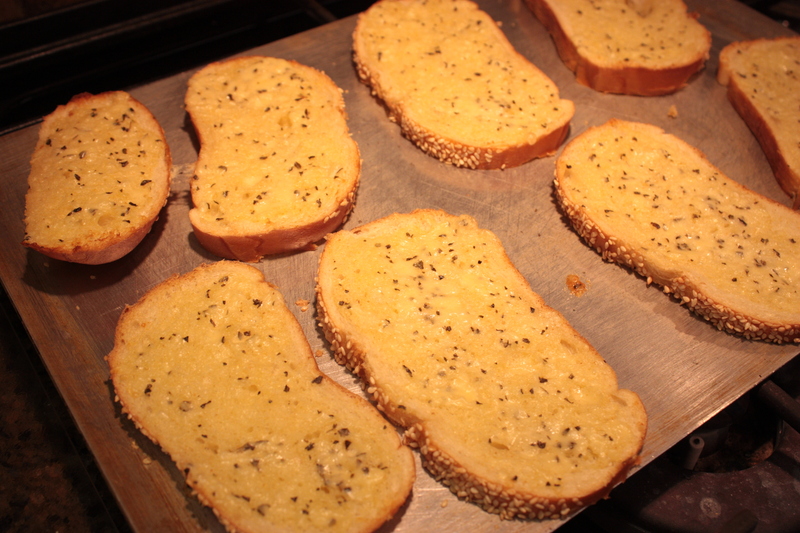 Serve with some delicious bread, perhaps with my mom’s tasty garlicky spread below! Mix it all together, spread on your bread of choice, and toast! *Mom usually makes this with Parmesan cheese, but tonight she grated some Dubliner, a nutty Irish cheese that I am in love with. It’s available at my local Kroger store and at Sam’s–if you can find it, try some–it’s spectacular! Soup is just so nice. Happy December! This entry was posted in Savory and tagged Bulgur, food, garam masala, Garlic cheese bread, Indian spice, natural foods, recipe, Tomato Bulgur Soup by needtotaste. Bookmark the permalink. 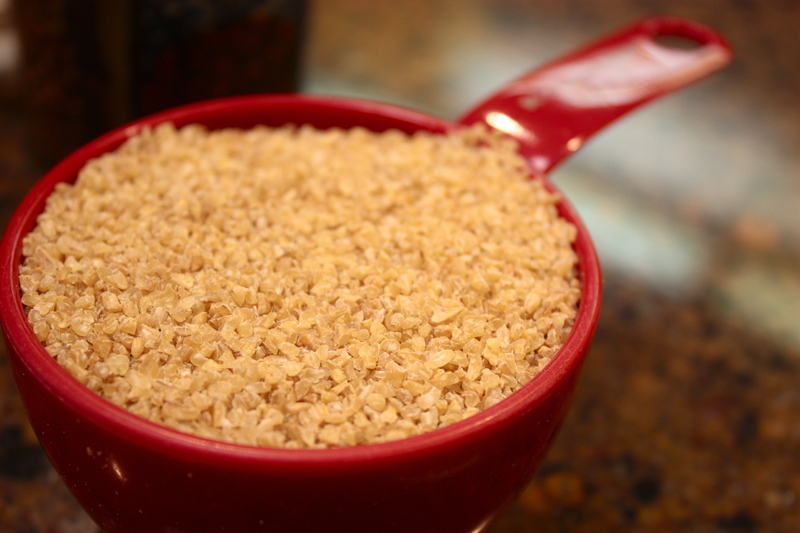 I love bulgur and never use it this way. Looks wonderful.